Religion can be defined as the search for significance in ways related to the sacred while spirituality is the search for the sacred (Viftrup, Hvidt & Buus 2013). It is possible to critique the idea of spirituality as commonly understood (Viftrup, Hvidt & Buus 2013). The popular conception of religion is that it is external and has negative connotations while spirituality is more internal and generally has positive connotations. Spirituality in contemporary meanings tends to be decontextualized, but spirituality does not occur in a vacuum. In an individual it arises, develops and unfolds in a larger religious context, even if that context is rejected. Spirituality in contemporary meanings is romanticized, as only being positive, personal and linked to the best in human nature. Confronting such a notion, the spiritual dimension in life can be both positive and negative. Only using positive understandings of spirituality means that measurements of spirituality will be contaminated with positive psychological or human experiences (Viftrup, Hvidt & Buus 2013). Non Biomedical,Traditional Medical Systems constitute the majority of received health care by the worlds population, at 70-80% as estimated in 2003 by the World Health Organisation (Hartzell 2005). The advantages associated with studying Ayruvedic medicine and traditional Chinese Medicine as examples of Traditional medical systems include the fact that they have bodies of literature to encode their knowledge because they have been produced by societies with writing. For Ayurvedic Medicine there are references to healing in the early religious texts collectively known as the Atharvaveda but the foundational texts that describe Ayurvedic medicine, dating to around 700 BC (Ninivagg 2008 : 13) are the Caraka Samhita, Susruta Samhita and the Astanga Samgraha (Langford 2002 : 4). The Susruta Samhita describes surgical procedures and is written by Susruta while the Caraka Samhita, written by Charaka and the Astanga Samgraha describe non surgical therapies that include herbal and mineral medicine, massage and blood letting (Langford 2002 :4). There was an acknowledged identification between the external ritual fires used for sacrifice in Vedic religious rituals, an idea of an internal digestive fire and the transformative power of Agni (fire) (Ninivaggi 2008 : 13) in the writings of Charaka and Sushruta, ideas deriving from the Vedic religion. Much of Ayurvedic medicine was recorded by Bhuddhists in the 6th century and their writing tended to attempt to rationalise the older Vedic traditions removing much ritual (Ninivaggi 2008 : 17). For TCM the foundational texts include Questions and Answers and Canon on Acupuncture, Two volumes of the Yellow Emperors Canons on Medicine, Shen Nong's Materia and the Treatise on Febrile and Other Diseases (Stella Quah 2006). The two volumes of the Yellow Emperors Cannons are called the “Huang Di Nei Jing Su wen” (Su wen) with the “Huang Di nei jing ling shu” (Ling shu) (Yellow princes inner classic spiritual pivot), they can be understood as foundation texts in Chinese medical history that are comparable to the tradition of Hippocratic writings deriving from Ancient Europe (Unshuld 2003), the Su wen was compiled over the 3rd century BC to the 1st century BC, both texts are both referred to as the Huang Di nei Jing. Song period scholars date the Su wen as written in the Warring State period . These foundational texts are ancient and are the earliest literature in medical traditions that have been built upon over centuries. There is an element of faith in these traditions in that the ideas contained in the foundation texts tend to be difficult to criticize by people working in these traditions. 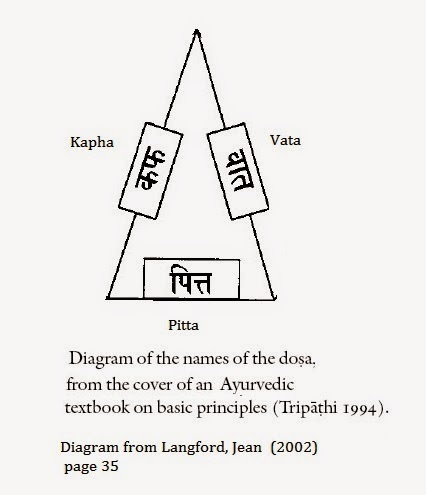 In the Ayurvedic Medical Tradition there is an idea that illness occurs because of an imbalance of three bodily dosa (vata “air”, pitta “bile” and kapha “phlegm”), the body is conceived as fluid and penetrable, in a continuous exchange with the social and natural environment (Langford 2002 : 11). To apply these ideas, an investigation of illness (darsan) will consider the predominant dosas evident in the patient’s body in terms of dhatu (tissue) and indriya organs and the patients Prakrti, or constitution (Langford 2002 : 28) which involves consideration of the patients behaviour and their relationship to their environment. 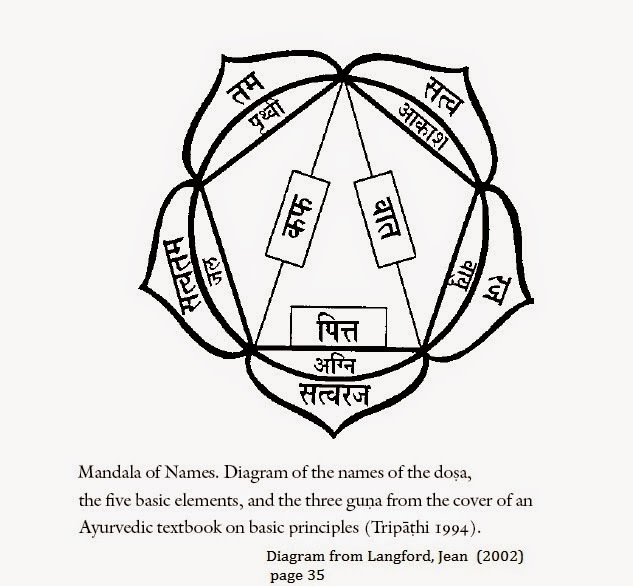 The Ayurvedic cosmology is composed of five elements, mahabhutas which are prthvi (earth), jal (water), agni (fire), Vayu (air) and akasa (ether) (see figure 3 (From Langford, Jean 2002 : 35). The elements are associated with five senses and body parts, Akasha with sound and the ear, Vayu with feeling and the skin, Agni associated with appearance and the eye, Jalam with taste and the tongue and Prthivi with smell and the nose. In the petals of the lotus are written three guna sattva (creation), rajas (destruction/ transformation) and tamas (preservation) with two hybrid guna sattvatamas and sattvarajas. Gunas can be described as “attributes or qualities that act to dynamically condition an ever changing arrangement within creation” (Ninivaggi 2008 : 289). All material substances possess these attributes (gunas). The interplay of the dosa modulate the gurvadi guna, or ten pairs of opposing qualities that can be used to describe matter. Humans in Ayurveda are in a homologous relationship to their environment and the greater nature around them, a microcosm within a macrocosm “pinda-brahmanda” (Ninivaggi 2008 : 38). In TCM the foundational books contain concepts of macrocosm microscosm correspondences (tien-jen-hsiang-ying) and harmony (tiao-ho) formed from a dynamic balancing. Thus the forces that are perceived in the macroscosm are conceptualised as having counterparts in the microcosm. These correspondences included astronomical systems, seasons, weather and time in the macrocosm and internal organs, functions, sensations and emotions in the microcosm (Keh-Ming Lin 1984). The origin of these correspondences are interesting in that they predate the attempts to rationalize them into a medical system as recorded in literature and may reflect a religious cosmological classification system that is associated with indigenous prophesy, such as the prehistorical origins of the I-Ching. From this framework three main themes of fundamental importance evolved, the yin-yang system, the Five evolutive phases and the ching-lo (meridian) system. Disease theory is classified into those that are acting internally and those deriving from external causes. Internal causes are attributed to 7 kinds of emotion, external causes are devided into six categories, wind (feng), coldness (han), hotness (shu), dampness (shih), dryness (tsao) and fire (huo). Wind in this classification system has a unique involvement in that it has the quality of “actively invading”, thus when combined with other properties makes the combination “dangerous” (Keh-Ming- Ling 1984). Wind is described in “Huang di nei jing” as a cause of disease, a natural phenomenon that causes disease within the human body. Its invasive properties had a transforming quality, in the traditional Ancient Chinese cosmology the winds of the four quarters affected food supplies, the direction influenced the seasons and the outcomes of battle (Unshuld 2003). The concept of Qi may have incorporated the concepts of wind and spirit (gui), and before the rationality of documented TCM, historically, spirits were seen to cause illness and misfortune, an idea that TCM attempts to move beyond. Acupuncture may have initially been seen as a way of dispelling spirits from the body, military metaphors persist in Traditional Chinese medicine that date back to this period (Hartzell 2011). Social and political life had to synchronize with the rhythm of the eight winds and four seasons. A section of the Mozi, dating to the 4th century describes a harmony of Yin and Yang, harmony between heaven and earth, harmony of ones body (flesh and skin) through sagely control of the desires (Brindley, Erica 2011). This concept of personhood corresponding to cosmology, political institutions and nature is in stark contrast to modern ideas of the individual, but the more comprehensive and detailed the vision of cosmic harmony became, the more sharply disharmonies were cast in relief (Unshuld 2003). Similarities between Ayurvedic Medicine, Tibetan Medicine and Traditional Chinese Medicine concepts of nature, cosmology and human physiology are striking (Hartzell 2011). 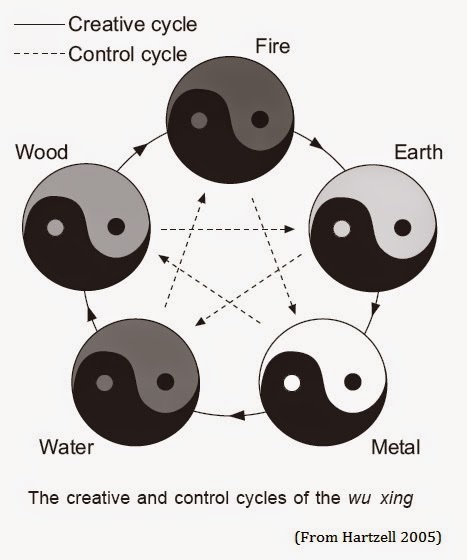 They all feature a fire, water polarity and a wu xing phase classification to understand biophysical processes and categorise medical phenomenon. The concept of a net of qi is similar to the concept of Tantra (web) in Ayurvedic Medicine (Hartzell 2011). This similarity may be due to Ayurveda coexistence with Bhuddhism, which spread to China by AD 65 and a potential early cross fertilization suggested by the recorded origins in pulse diagnosis (Ninivaggi 2008 : 22). Hartzell, Magda. (2005). Making sense of indigenous knowledge systems: the case of traditional Chinese Medicine. In Southern African Linguistics and Applied Language Studies. (2005). Volume 23, Number 2. Pages 156-175. Langford, Jean. (2002). Fluent Bodies : Ayurvedic Remedies for Postcolonial Imbalance. Published by Durham : Duke University Press. Lin, Keh-Ming. (1984). Traditional Chinese Medical Beliefs and their Relevance for Mental Illness and Psychiatry. In Normal and Abnormal Behavior in Chinese Culture : Culture, Illness and Healing. Volume 2, 1981, Pages 95-111. Ninivaggi, Frank John. (2008). Ayurveda A Comprehensive guide to Traditional Indian Medicine for the West. Published by Praeger Publishers. Pages 1-349. Quah, Stella. (2006). Traditional Healing as a Culture. In Innovation, Volume 6, Number 2. Pages 52-53. Unschuld, Paul U. (2003). Huang Di Nei Jing Su Wen : Nature, Knowledge, Imagery in an Ancient Chinese Medical Text. Published by University of California Press Ltd.
Viftrup, Dorte Toudal, Hvidt, Niels Christian & Buus, Niels. (2013). Spiritually and Religiously Integrated Group Psychotherapy : A Systematic Literature Review. In Evidence Based Complementary and Alternative Medicine. Volume 2013. 12.